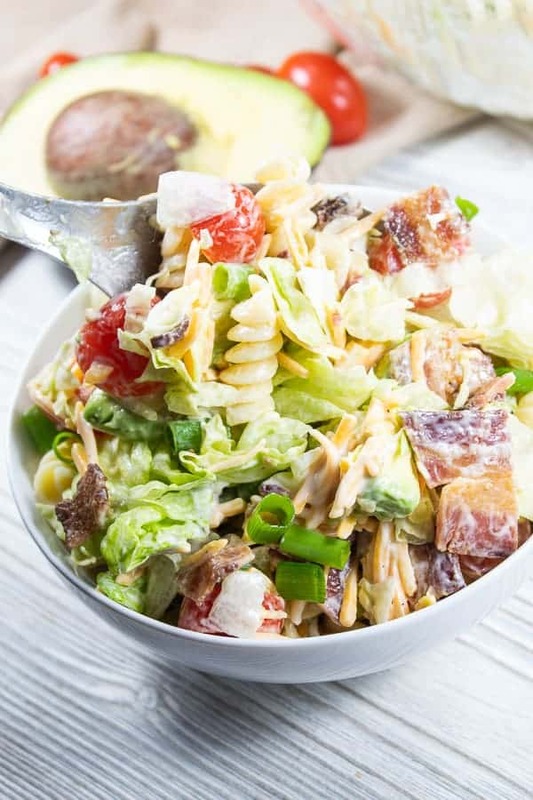 My mom used to make this BLT Salad with Ranch & Avocado when I lived at home, and it was always my FAVORITE! Yes, this is a salad. No, it’s not a ‘healthy’ salad. BUT- The Super Bowl is coming up this weekend and I thought instead of wings, dip, or anything deep fried, we could go back to basics for some delicious comfort food- in a different form, with a few more veggies. 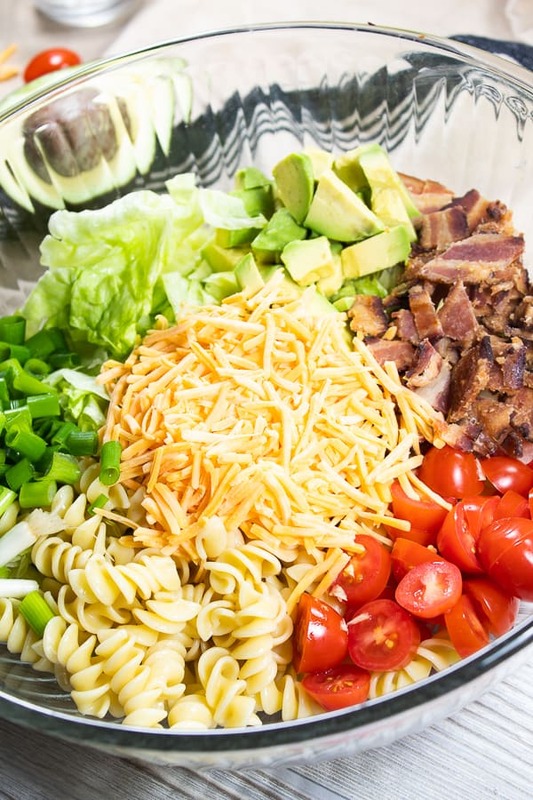 Delicious and fresh, as a BLT Salad SHOULD be! This is a super simple recipe; it’s really no fail. You could try a bunch of variations of it, too! Add whatever veggies sound good to you! Roasted corn, jalapeño, asparagus, you can really make it your own. Not a fan of bacon? Use chicken! Leftover or rotisserie chicken would be great. Steak would be great as well; use bleu cheese dressing and it’s a pasta wedge salad dupe! 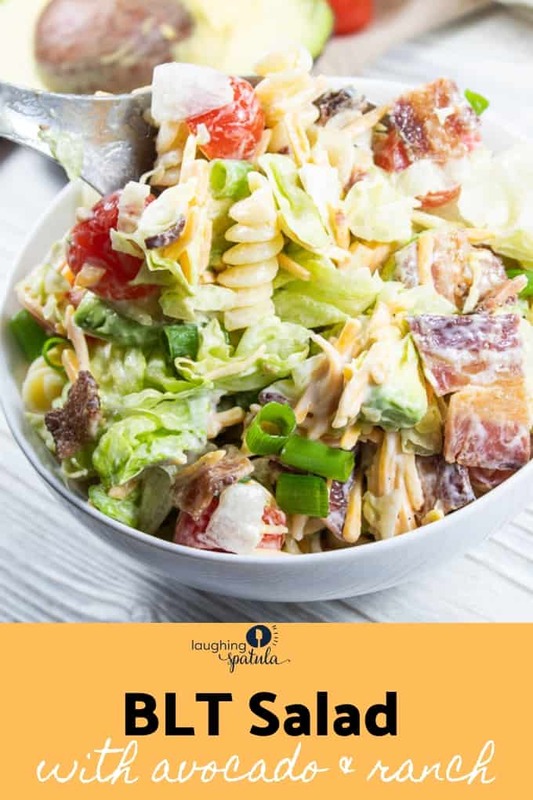 Swap out the cheddar for parmesan, the bacon for chicken, and use caesar dressing- another delicious, lunch friendly salad. 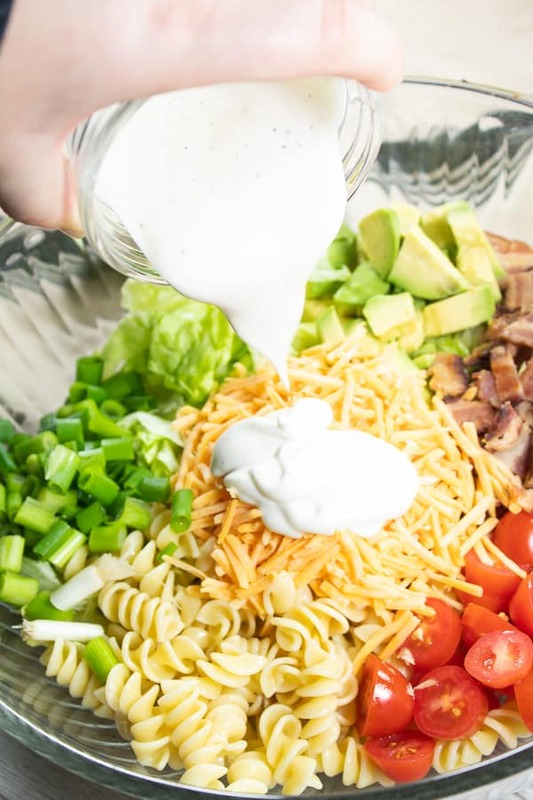 We use Hidden Valley ranch, but you could make your own (our favorite ranch dressing recipe is here. 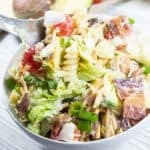 Need some more great salad recipes? Check out this wedge salad platter for a crowd– delicious toppings with quartered iceberg lettuce sections for your guests to enjoy. Also, this Crunchy Thai Chicken Salad with Homemade Peanut dressing will knock your socks off! To hearty, and delicious salads! This delicious salad is perfect for weeknights, football parties, and potlucks! Ensure all vegetable ingredients are dry beforehand by patting them with a paper towel. Ensure bacon and pasta is fully cooled. Lightly toss to distribute dressing, careful not to smoosh avocado. Add more dressing if desired, along with salt and pepper, serve & enjoy!